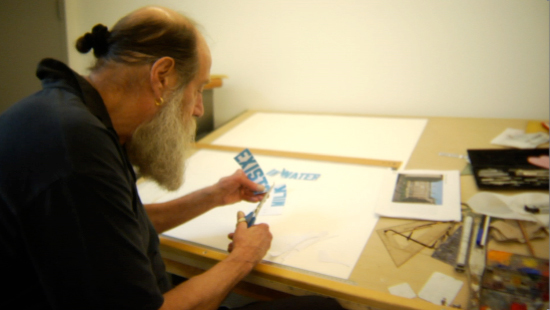 One of the central figures of Conceptual art, Lawrence Weiner’s work is the currently the subject of a major retrospective at MOCA in Los Angeles entitled As Far As The Eye Can See. Other recent solo exhibitions of his work have been mounted at the Hirshhorn Museum and Sculpture Garden, Washington, D.C. (1990), Institute of Contemporary Arts, London (1991), Dia Center for the Arts, New York (1991), Musée d’Art Contemporain, Bordeaux (1991 and 1992), San Francisco Museum of Modern Art (1992), Walker Art Center, Minneapolis (1994), Philadelphia Museum of Art (1994), and Museum Ludwig, Cologne (1995). In addition to publishing numerous books, Weiner has produced various films and videos, including Beached (1970), Do You Believe in Water? (1976), and Plowman’s Lunch (1982). Today's episode of Design Matters is a very special treat: rather than a radio interview, the interview is conducted in-person, filmed earlier this month in Mr. Weiner's studio in Greenwich Village. And I am truly thrilled to announce that the extraordinary and brilliant Hillman Curtis directed and co-produced the film. I hope you enjoy it. For behind the scenes photographs of the shoot, please go here. For more of Hillman's luminous films, please go here.